Author: Schroeder, Karl Set In . 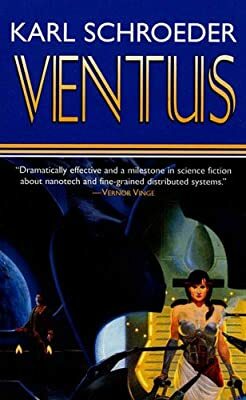 . .
Ventus is a large-scale Hard SF adventure novel in the tradition of Larry Niven, Vernor Vinge, and Arthur C. Clarke. Karl Schroeder, a physicist and writer, is a winner of Canada's Aurora Award. His first novel was called the best first fantasy of the year by Science Fiction Chronicle, and now his first SF novel launches a major career in SF. Young Jordan Mason, on the terraformed planet Ventus, has visions. Kidnapped by Calandria May--a human from offworld sent to investigate the AIs (the Winds) of Ventus--Jordan is desperate to find the meaning of his visions, desperate enough to risk calling down the Winds that destroy technology to protect the created environment, who descend and wreak havoc. As a result Jordan escapes from Calandria and sets out to discover his destiny on his own. Calandria and others, both human and AI, search for Jordan, who holds the key to catastrophe or salvation. Ventus is an epic journey across a fascinating planet with a big mystery--why have the Winds fallen silent? It is one of the major, ambitious SF novels of the year and the international launch of an important new hard SF writer.